Flat Holm Island Nature ReserveJust 5 miles from Cardiff and Barry, the tiny island of Flat Holm is a different world with a wealth of history and wildlife. You will be amazed at how much there is to discover. Since the Dark Ages, Flat Holm has been a retreat for monks and since then has acted as a sanctuary for Vikings, Anglo-Saxons, silver miners, smugglers and cholera victims. Fortified in Victorian times and again in World War II it is perhaps most famous for receiving the first ever radio message across water by Marconi in 1897. 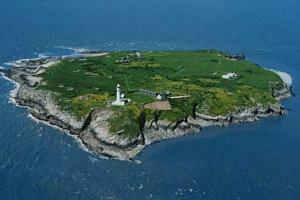 Just 5 miles from Cardiff and Barry, the tiny island of Flat Holm is a different world with a wealth of history and wildlife. You will be amazed at how much there is to discover. All day trips depart from the Barrage South Water Bus Stop, situated in the Penarth Marina aboard the Lewis Alexander and the crossing takes about 50 minutes. Parking is available in the Barrage South Car Park and we can provide you with a parking ticket valid for the day of your visit when you book. Please be at the departure point 15 minutes before the boat is due to leave.